A creative writing workshop for young people from Wrexham, linked to one of Wales’ premier cultural festivals, has taken place at Wrexham Glyndwr University. Hay Festival Scribblers Tour brought hundreds of schoolchildren from across North Wales to the university’s Plas Coch campus, where they spent a day working alongside award-winning young adult fiction writers as part of a series of free events across Wales. Now in its eighth year, the tour aims to encourage and engage young people in storytelling and conversation and to inspire empathy and creativity. 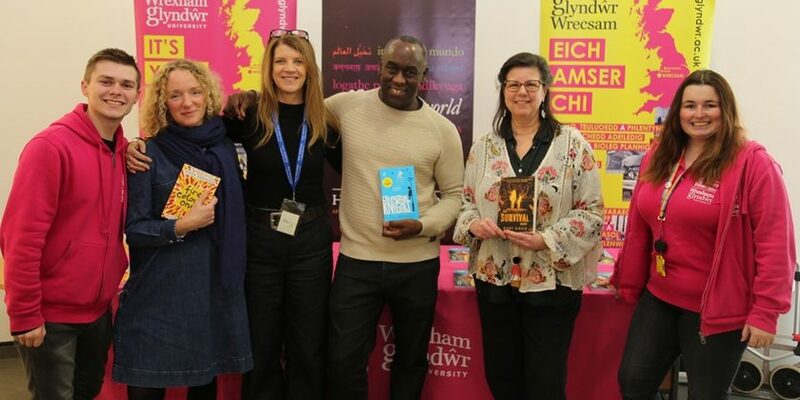 Two sessions were held at Glyndwr over the past fortnight, with participants including Hip Hop artist, poet and writer Karl Nova and journalist and historical fiction writer Emma Carroll, novelist and playwright Nicky Singer, and award-winning writer Alex Wheatle. Pupils from Darland High School in Rossett and St Joseph’s In Wrexham were among those who took part. Aine Venables, Education Manager at Hay Festival, said: “Every May in Hay-on-Wye thousands of young people join us to meet their favourite writers, and now we’re bringing Hay to them. “In these free festival days we will be sharing stories, debating questions and celebrating the power of writing and reading for pleasure. Hay Festival Scribblers Tour is part funded by the Welsh Government and is part of Hay Festival Foundation’s wider outreach and education work that includes free Programme for Schools, Hay Academy, Hay Compass, The Beacons Project, School Exchanges, and the Hay Levels, a series of free educational videos. Cabinet Secretary for Education, Kirsty Williams said: “I’m delighted that the Welsh Government is able to support the fantastic Scribblers Tour at Hay Festival, which is now in its 8th year. “Hay Festival is renowned throughout the world, and the Scribblers Tour offers our pupils a fantastic opportunity to learn more about literature and creative writing, and listen to amazing inspirational speakers and authors that are masters of their craft. Sarah Louise Gaffney, widening access co-ordinator at Wrexham Glyndwr University, said: “We’ve been delighted to work with the Hay Festival to help put this event on here at the university. “Over the past fortnight, hundreds of young people from across North Wales have come along, met some of their favourite authors, and been inspired. More information about the Hay Festival can be found here.